Like many, I knew the works of Alex Colville almost entirely from the ubiquitous reproductions of his most well-known paintings. The blonde woman on the PEI ferry staring out with her powerful binoculars at who-knows-what. The haunting image of a large horse galloping down the tracks towards an approaching train, its searchlight probing the darkness. 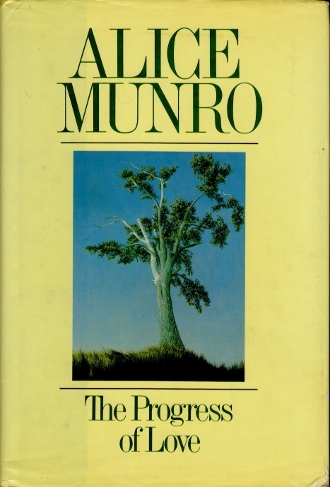 (I first saw that one on the cover of Bruce Cockburn’s wonderful album, Night Vision.) An early painting that perfectly captured the long march of worn-out Canadian infantry through the snowy, flooded flatlands of Holland. 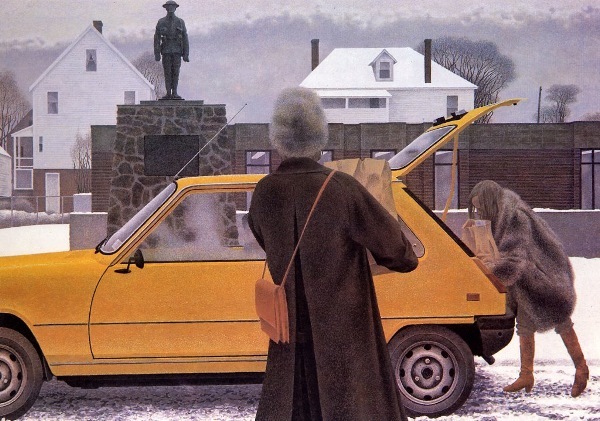 And a few other depictions of meticulous “frozen in time” moments that were Colville’s trademark. Frankly, I didn’t think that much of him as an artist, archly regarding him as someone having more of a shtick than touched by the sublime. 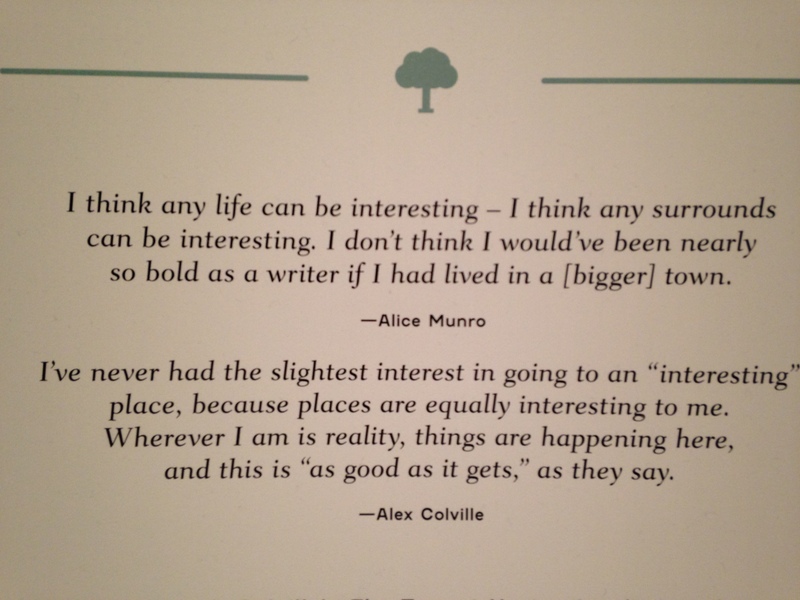 As she observes, Colville was gentler to his subjects and small town life than was Munro. But not always. 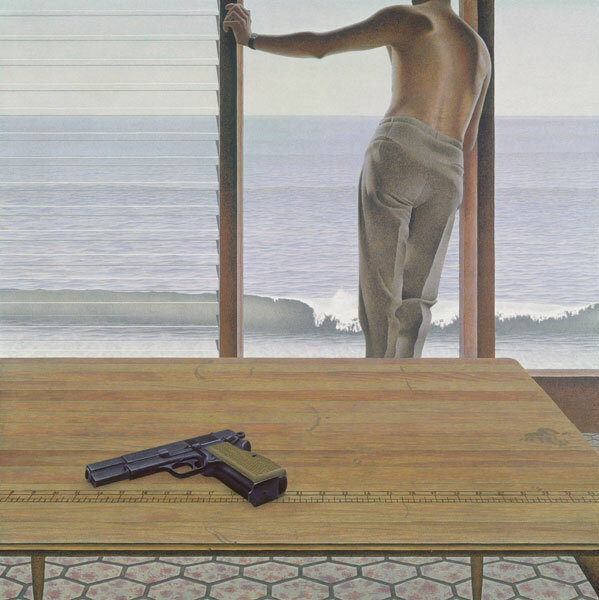 I was surprised to see the prominence of guns in several of his paintings, often without explanation, as if some sort of violence were just around the corner. And, even without guns, there is often a hint of something disturbing about the outwardly simple scene he portrays on canvas. The more you stare at these powerful paintings, the more menacing they seem. 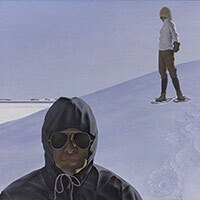 I was particularly taken by a painting I hadn’t seen before, January (1971), which depict a couple out snowshoeing. The man, in a hooded parka and sunglasses, stares straight ahead. He looks angry. His companion, a ways behind him, looks nervously over her shoulder at something or someone unseen. Disconcerting, to say the least, and open to a multitude of interpretations. Meanwhile, Stanley Kubrick’s famous fright film, The Shining, has not one but four Colville paintings on the walls in various creepy scenes. The AGO helpfully lists what appears when in the movie: Woman and Terrier, 10:57; Horse and Train (of course), 14:31; Dog, Boy, and St. John River, 58.30; Moon and Cow, 2:09:32. See it again! Here’s some other stuff I learned. Colville designed the special Centennial coins (remember the rabbit?). 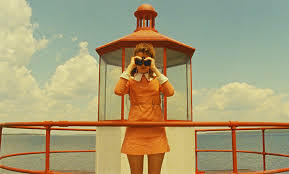 A scene in Moonrise Kingdom is almost a straight steal from Colville’s famous binoculars painting. Because life is forever stranger than fiction, when Colville showed a neighbour, a professor, a painting he had made of him out for a walk, the we are told that the neighbour recoiled. 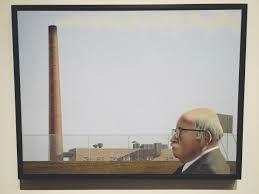 He had lost his family to the Holocaust and prominent in the background of Colville’s painting was a large smokestack. 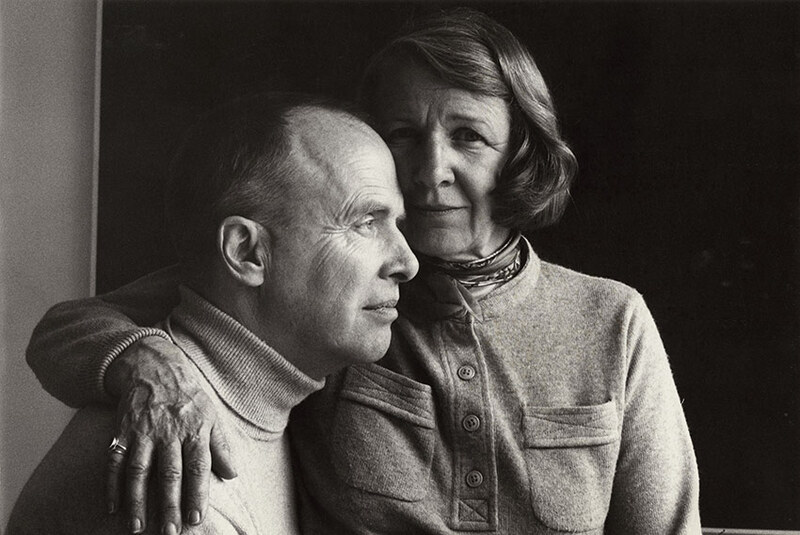 And I had no idea of the shocking calamity that struck Rhoda Colville, the artist’s wife and muse for 70 years. Just eight years old, she lost her father, sister, brother, grandfather and an aunt in one fell swoop, when their car collided with a train, killing all five. We first come across the tragedy in an otherwise light-hearted comic book on Rhoda’s life more than halfway through the exhibit, tucked away in an obscure display corner. I rarely remember an exhibition so absorbing. Almost every painting commanded attention. No wonder it was the 10th-most attended exhibition in the history of the AGO, with the highest ever for a show featuring Canadian art. 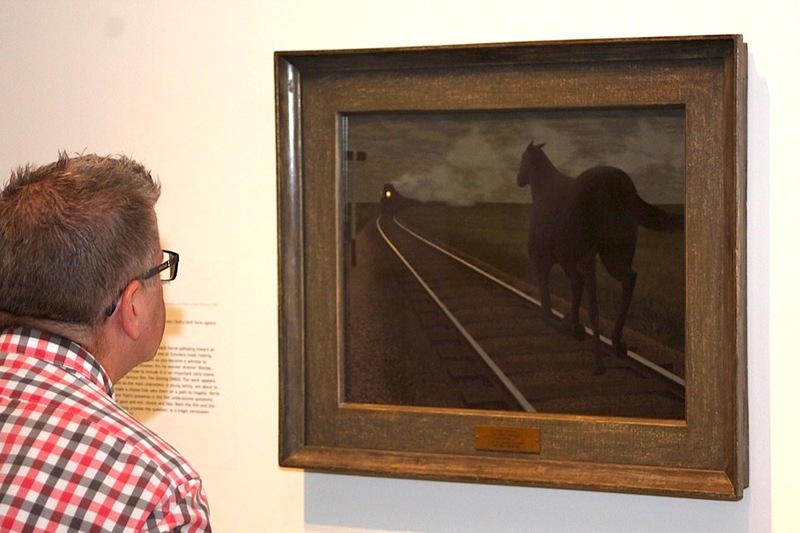 The Colville retrospective moves to the National Art Gallery in Ottawa on April 23. If you’re in the ‘hood, it’s a must. It’s been a tough month for those of us who have been around ye olde J-biz in Vancouver for a while. 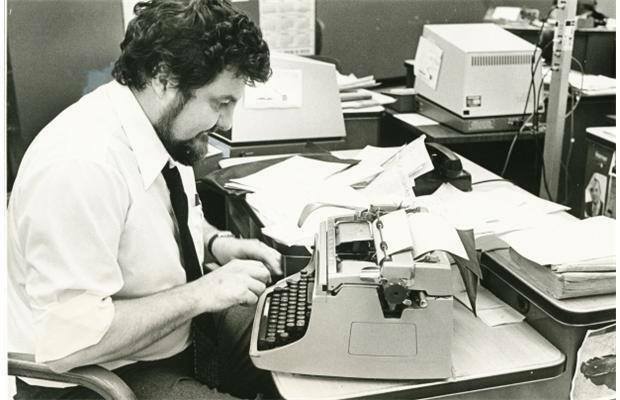 Three journalists many of us knew and admired have passed on to the great typewriter in the sky. Sean Rossiter, dead at 68 from the ravages of Parkinson’s. The incomparable Doug Sagi, taken from us just short of his 80th birthday by complications from non-Hodgkin’s lymphoma. 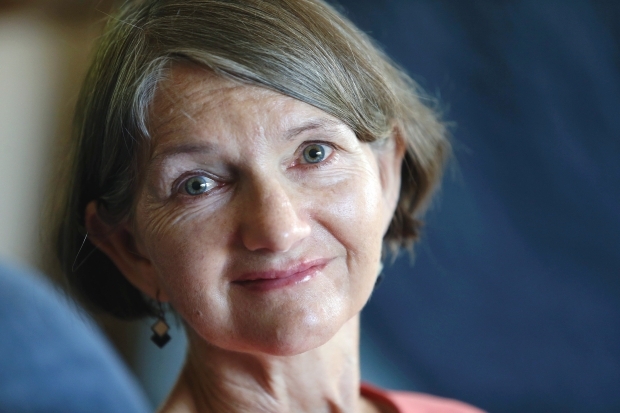 And most recently, and most heartbreakingly of all, the courageous Alicia Priest, her life cut short at 61 by the truly terrible scourge of ALS. I mostly knew Alicia from a distance, via occasional phone calls, emails and paths crossing when we were both journos in Vancouver. But as a one-time health policy reporter myself, I was a big fan of her excellence on health policy matters. A former nurse, she knew the field, and her solid, comprehensive articles were always on the side of improving the country’s beleaguered health care system. Many made their way into my bulging clipping files. Alicia cared, and she was smart. With life partner Ben Parfitt, a master of the thorough, hard-hitting, investigative report, the two eventually abandoned working for bosses, forging a freelance living for themselves in Victoria, while raising their daughter Charlotte. Alicia faced her fate head on. She chose to regard it as a deadline for a writing project she’d had in her mind for years: the story of her family and her flawed, off-beat father, who masterminded the great Yukon silver heist of the early 1960’s. Of course, it was a deadline no writer or reporter would ever want, but it was a deadline nevertheless, one referred to by Alicia as “the ultimate deadline”. As always, she met it with flying colours. Her book, A Rock Fell on the Moon, was published to glowing reviews last fall. 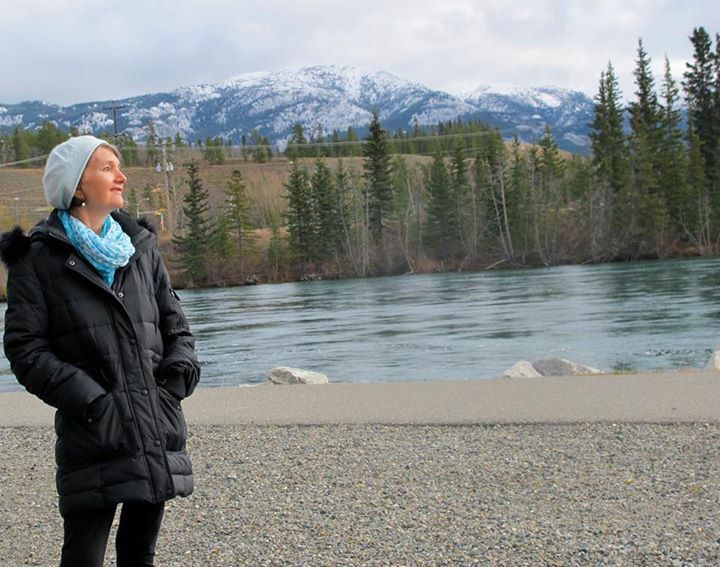 Best of all, although unable to speak and nourished through a tube, Alicia was able to return to the Yukon in October for a very special book launch at the Baked Café in Whitehorse. A Rock Fell on the Moon is a fine, fascinating read, well-researched and well-told. It relates a saga that seems, itself, to come from the moon, accompanied by the heartbreak of growing up in a dysfunctional family. The book has a little bit of everything, including some vintage stuff about life in a remote, Yukon mining town. Recommended — as an unflinching glimpse into a time that has long passed, a family’s intimacies, and larger-than-life characters who might have been pulled from the pages of Elmore Leonard. This time, life, so often desperately unfair, wavered just long enough to reward her heroic effort to finish the most important story of her career. Here are two excellent features about Alicia that were written last fall. They serve as vivid reminders of how much spirit and talent were lost with her tragic death. Yet there was more to Sagi than that. He was a lovely human being, with a finely-tuned sense of humour, a highly-appreciated mentor to young reporters, someone who enjoyed life and tolerated all our bitching with a bemused twinkle in his eye. He took the job of journalism seriously, yet was never shy about laughing over its vagaries, and criticizing its failures. He was a joy to be around. 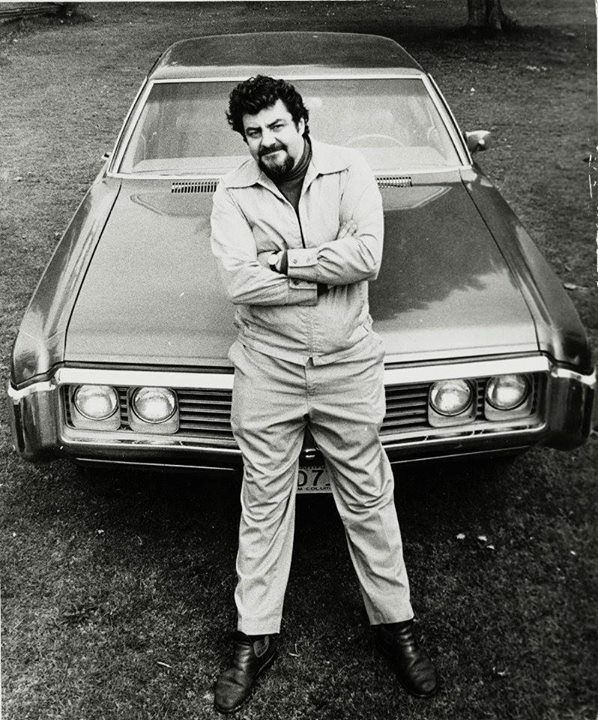 When Sagi joined the Vancouver Sun in 1975, after stints with Canadian Magazine and a time as one of the Globe and Mail’s first western correspondents, I thought it was a real coup for the Sun, and a bit of a come-down for the man, himself. But maybe he relished the stability and the extra bucks of a good-paying union job. He may also have liked the chance to write a regular column, and eventually “win” a spot on the desk as a seasoned assignment editor. When word came of his death, Facebook tributes quickly accumulated, many from reporters counselled over the years by Sagi’s trademark wit and wisdom. I particularly liked this anecdote from Chris Gainor, which, I think, captures the measure of the man. Having covered the legendary John Diefenbaker during his young newspapering days in Saskatchewan, Sagi was the Sun’s obvious choice to ride and report from the Dief funeral train. Sagi also knew of Gainor’s strong admiration for “the Chief”. So he picked up an extra copy of the official funeral program and gave it to Gainor when he got back. “It remains a valued part of my Diefenbaker collection,” wrote Gainor. Ever classy. A memorial service for Doug Sagi is scheduled to take place Saturday, Jan. 17, 2 p.m., 1450 MacCallum Road, in Abbotsford. It’s in the amenities room at the Crown Point townhouse complex. 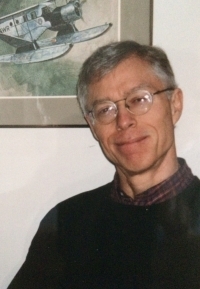 Finally, there was Sean Rossiter, who died Jan. 5, after a long, tough struggle with Parkinson’s disease. I remember Rossiter more from the old days, during his brief tenure at the Vancouver Sun, when he was Tom Rossiter and the first guy I ever knew to write about ferns and household plants. Strangely, he was also the papers religion editor. Rossiter soon tired of the Sun, however, and bravely ventured into the world of free-lancing at a time when such a career move was considered ill-advised at best. But he prospered. For 16 years, he wrote a monthly, groundbreaking city hall column for Vancouver Magazine that treated urban affairs as more than just the latest political shenanigans at 12th and Cambie. As someone mentioned during Thursday’s memorial, “Rossiter made urban planning seem interesting.” He also wrote regularly about one of his many passions, the value of old buildings and heritage. But his bread and butter were long, superbly-crafted magazine features and a myriad books on a myriad subjects. Rossiter defined the term “successful free-lancer”. I was never that close to Rossiter. His early tendency to look down on daily journalism irked me. However, he seemed to mellow on that score as time went by, and I was always glad to run into him. No one could deny his talent and ardent embrace of subjects that mattered to him. His death is a loss for the craft of the written word. I do have one Rossiter anecdote from those funny days at the Sun, way back when. One Sunday, as he sped to work over the Granville Bridge in his vintage Morgan sports car, he was pulled over by the cops. A quick check revealed a raft of unpaid speeding/parking tickets, and he was tossed in the hoosegow. With his one phone call, he called city desk. Sunday staffing being what it was, a young Lesley Krueger was dispatched to the Main Street lockup to bail him out. There, she discovered that Tom Rossiter was listed on the police docket as Tom Seaport Rossiter, which office wags immediately began using as his real name. Meantime, after being sprung from jail, Rossiter was driven back to the Sun newsroom to finish his shift. It was a normal day. Here is Charles Campbell’s heartfelt piece on Sean Rossiter. Alicia Priest, Doug Sagi, Sean Rossiter. May you all rest in peace. Like so many fans of the local Canuckleheads, I was an off and on admirer of Roberto Luongo during his seven years with the team. Loved him, soured on him, then grew to admire him, despite all the abuse he took from the knuckleheaded folks who have given Vancouver its sadly deserved reputation as a goalie graveyard. Nothing can erase those mystifying playoff breakdowns that plagued Luongo at key moments in his career with the Canucks. Painful memories of the big guy flopping around like a beached whale, minus his stick, or whiffing on a shot to the short side are hard to forget. Yet, it’s useful to recall the rest of the team didn’t play well in some of those games, either. As a longtime “Icepack” ticket holder, I see about a dozen games a year at the Aquilinis’ cashbox. Until this year, my seat was behind the Canucks’ goal for two of the three periods. So I saw a lot of Luongo in net. More often than not, you could tell almost from the first shot whether Lu would have a good night. If he was sharp on the first tough shot, he was almost always solid for the rest of the game. “He’s on the puck tonight,” I would tell my seatmate, meaning his reaction time was quick and precise. If he seemed uncertain early on, he usually battled the puck for the rest of the game. Why someone as good as Luongo would have these off-nights was always a puzzle, and they frustrated me as much as anyone. I really became a member of Lu’s Legions the night he was injured in a pile-up and had to leave the game. 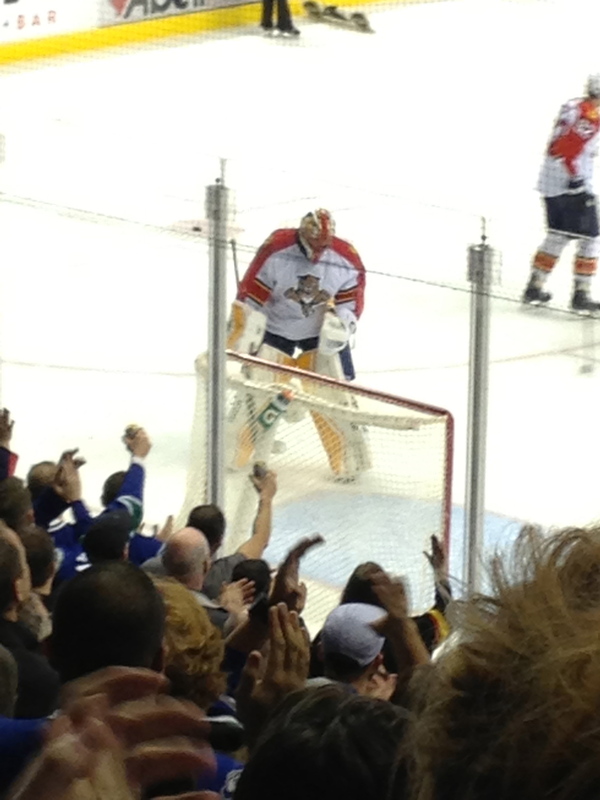 As Luongo wobbled off and Schneider skated on to replace him, the fans cheered. I thought: what a shabby, tasteless treatment of a guy who had done so much and played his heart out for the Canucks. I’ve been firmly in his corner ever since. So I was sad to see him depart for Florida. That followed John Tortorella’s unforgiveable decision to leave Luongo on the bench for last year’s Heritage Classic, a game he yearned to play. It was the worst move by a Canucks’ coach since Trevor Linden was pressured to give up his captaincy to the appalling Mark Messier in 1996. Luongo soon decamped with his rich, multi-year contract to the far more relaxed environment of The Sunshine State, where he met his wife and started his NHL career. Despite my own sorrow, I was happy for Lu, and he has responded with a solid season so far for the surprising Panthers. Which brings us to Thursday, when Luongo returned to the Rogers Arena for the first time since his hasty leave-taking last March. It turned into a grand occasion. For a change, the fans were classy. 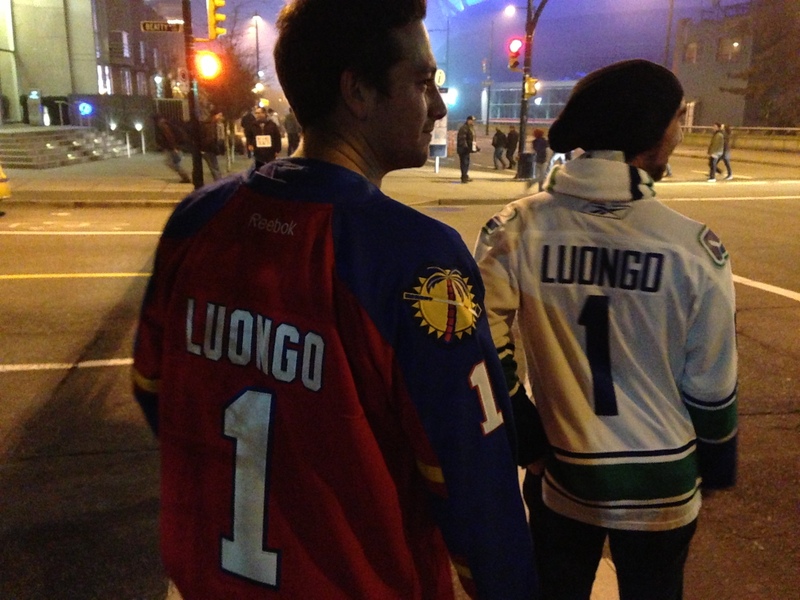 The Luongo haters were absent. It was all “Luuuuuuu”, not “Boooooo”. The familiar low cheer rumbled through the rink every time Luongo made a decent save. Right off the bat, as my favourite netminder flashed his thick pads to deflect a quick, hard shot into the corner, I said to my seat-mate, as I had so often in the past: “He’s on the puck tonight.” And indeed, he was, stopping 31 of the 32 shots the punchless home-towners fired his way. He was an easy choice as the game’s first star in the Panthers’ 3-1 victory. Many of us stayed behind to roar for Lu as he skated out to acknowledge his selection, the first time I can remember a guy from the other team doing that. 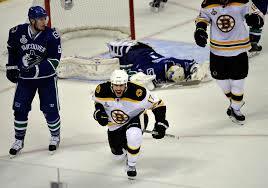 The roar got louder, when Luongo did what he always did, after being chosen a star for the Canucks. He headed to the boards and gave his big goalie stick to a kid. Skating off, he clapped his hands to acknowledge our cheers. That was great, but the most emotional moment had come much earlier. 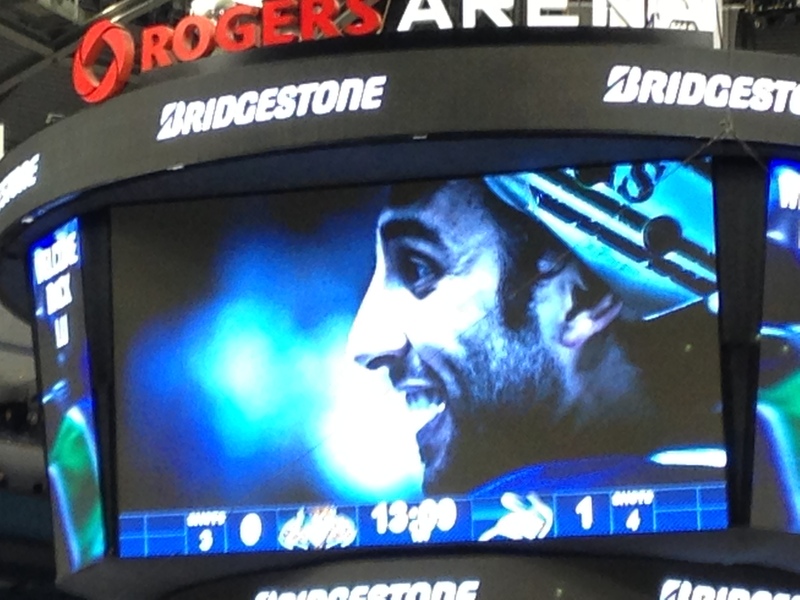 During a first period break, the Canucks’ showed a video highlight of Luongo’s career with Vancouver. The crowd rose as one, cheered mightily, and of course, serenaded the Panthers’ goalie with the loudest “Luuuuuu” of the night. 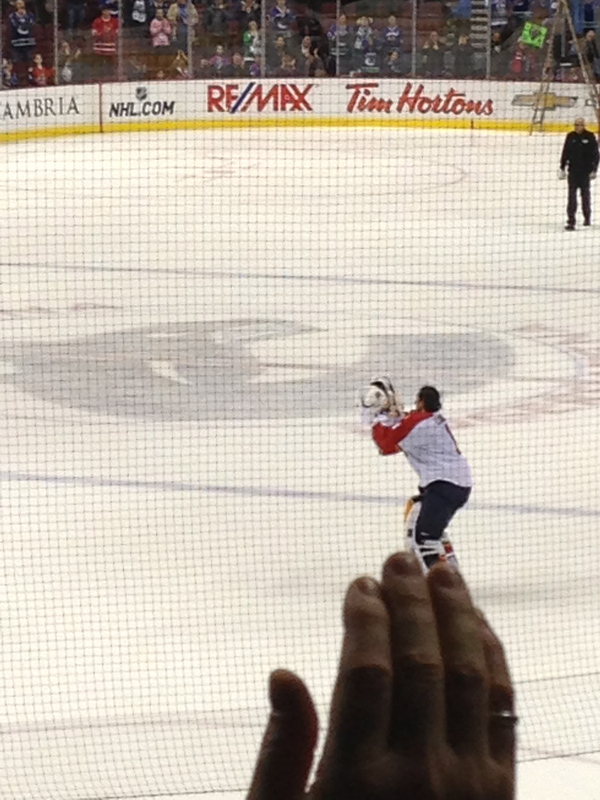 A bit unsure what to do, Luongo took off his mask, raised his stick and touched his heart. Perfect. I’m sure I wasn’t the only fan who left the game with a happy smile. Good on you, Lu. Thanks for the memories. Some collect Pez dispensers. Some collect autographed baseballs (hello there, Geddy Lee), or snow globes. Some, from the dark side, collect pig figurines. Me, I collect “expert” headlines — from this morning’s Globe: “Mass murders stun Alberta’s experts” — and, wait for it, Annunciations. 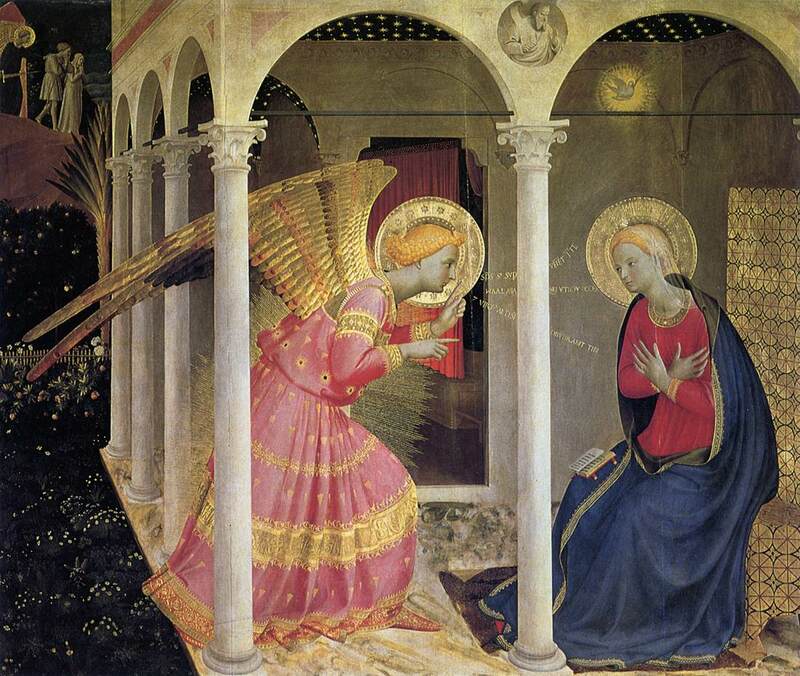 You know…the Annunciation, that precise, biblical moment when the angel Gabriel swoops in on her wings and gives Mary the news that she has been chosen to give birth to the son of God. Ho hum. Just another day in Nazareth. 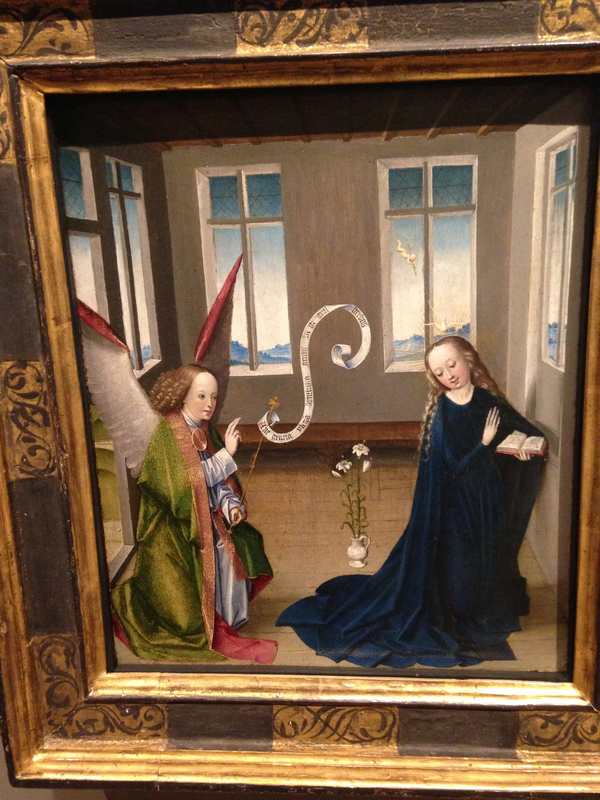 During the late Middle Ages and the glorious Renassiance, the Annunciation was an exceedingly popular subject for any painter worth his smock. (Today, there are selfies.) There is a tension in this extraordinary happening that I really like. Just the two of them, sharing a moment like no other. It’s wide open to the artist how to set up the clutter-free scene, and so many different ways to depict the angel and the Virgin, whose expression can range from total shock (“What will I tell Joseph?”), through reluctance, to a saintly acceptance. I also like the fact that Mary is often shown reading a book. 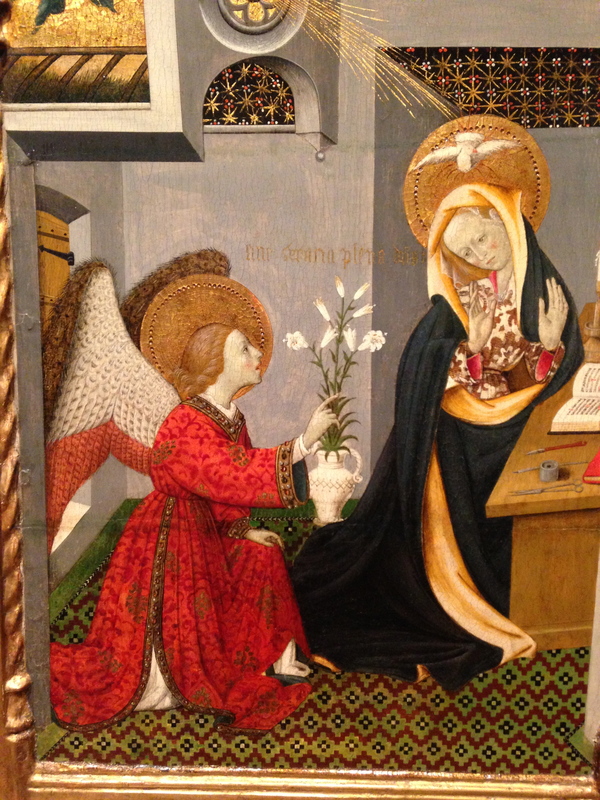 Rare is the old church in Europe that doesn’t have at least one Annunciation to its credit, and, of course, they are chock a block in the great art galleries of the world. I have scores of postcard reproductions in my collection and many, many photos. While it’s hard to surpass the famous Annunciation paintings of Leonardo da Vinci and Fra Angelico, one often finds examples tucked away in obscure corners of obscure churches by obscure, unknown artists that are just as affecting. 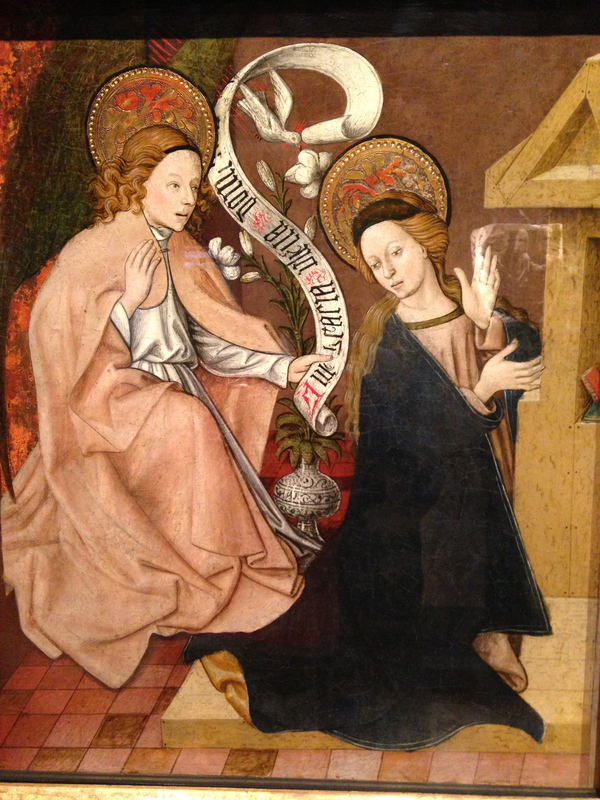 Last week, I came across an unexpected plethora of Annunciations. With half an hour to kill after taking in the enthralling Van Gogh to Kandinsky exhibition at the Montreal Museum of Fine Arts, I opted for a bit of late browsing amid the Museum’s modest Middle Ages collection. And there, much to my delight, were not one, not two, not three, but four (!) 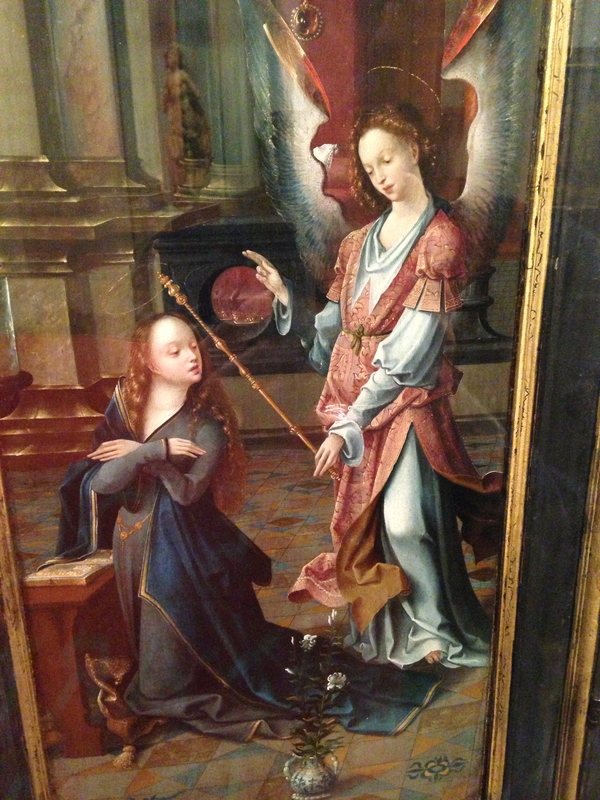 Annunciations. None by artists anyone has ever heard of. But, like almost all Annunciations, they are heartfelt. I snapped away, of course. And, just for fun, here they are, he announced, self-indulgently. Maybe you’ll get hooked, too. WOODY SEZ: HAPPY NEW YEAR, EVERYBODY! Woody Guthrie was a true original, one of those guys who emerge from the most unlikely of environments with a creative genius that comes from “God knows where”. Shakespeare, son of a glove merchant in 16th century England. Dickens, with the worst of fathers and starved provincial upbringing. Bob Dylan, raised in the mining wilds of Hibbing, Minnesota. And Woody, from a debt-ridden, small-town Oklahoma family, touched by disease and tragedy. 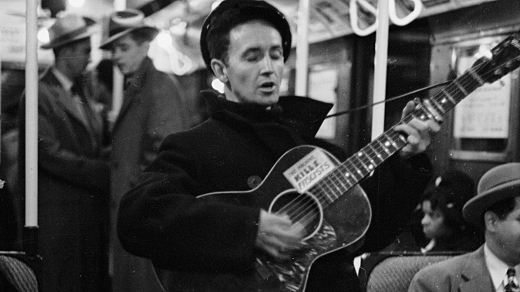 But something within Woody Guthrie produced scores of some of the most evocative songs of the people ever written, and a life that was itself a page-turning novel. Would there have been Bob Dylan without his early idolatry and the inspiration of Woody Guthrie? Maybe not. Woody never hit the big time as did Jimmy Rodgers, Hank Williams and a few others of his ilk. It’s not hard to figure out why. He was often chaos in motion, he hated Tin Pan Alley, and he was a man of the left, far more at home on the picket line than in a recording studio. He was content to scuffle through life, doin’ what came naturally. 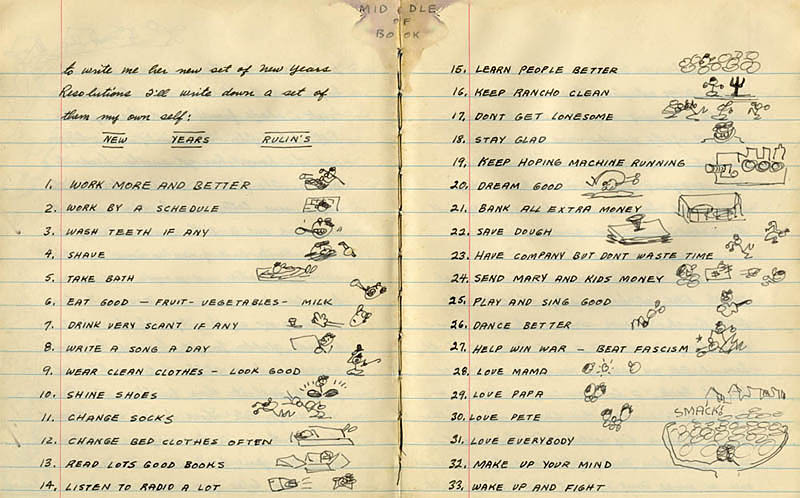 Since it’s that time of year and better than the pop of champagne corks: herewith, Woody Guthrie’s homespun New Year’s Resolutions for 1942, a dark time when fascism had overrun virtually all of Europe. He called them his “New Years Rulin’s”. Some would not be out of place today. Happy New Year! Eat food – fruit, vegetables, milk. Drink very scant if any. Write a song a day. Wear clean clothes – look good. Listen to radio a lot. Have company but don’t waste time. Send Mary and kids money. Help win war – beat fascism.